SOLUTIONS: Colonel, how long have you worked with the Colombian National Police? What was your original purpose for becoming a Police Officer? How did this change for the better after you found The Way to Happiness? COLONEL PRADO: I have been part of the police for over 21 years. My main objective in joining the police was to be able to serve my community, and help the people of my country. The Way to Happiness affected my position with the police in a very positive manner. The improvement was very rapid, and it all began with myself, then my family and after that all the people that were around me. The book gave me the courage to protect my environment and my community. With that we started being more efficient and competent, and because of that we were able to decrease the crime rates in Colombia. SOLUTIONS: What kind of problems were you having before you were introduced to The Way to Happiness? COLONEL PRADO: We felt alone, without the tools to be able to perform our duty; tired of trying to reduce crime rates but never able to get those statistics down. People in general didn’t care, not even for themselves. There was a lot of chaos between other officials that had a lot of problems caused by the exposure to criminals. And we used to have a lot of police officers that failed their duty and became part of the corruption of the country. SOLUTIONS: How did you find out about The Way to Happiness? COLONEL PRADO: The first time that I heard of The Way to Happiness was in a presentation that Andres Lopez (award-winning Colombian comedian and actor) did for the police department at the Bogota Officers and Patrol club. At that time, I was working as the police national coordinator of Colombia’s childhood and adolescence department. So I had the opportunity to work with young people all over Colombia, from elementary schools to universities. In the seminars and conferences that I was delivering, I tried really hard to introduce moral values, since children are the future of our country. I wanted them to be ethical and to teach them about morality and respect, so they could help with the social change that Colombia needs. I realized that the key to be able to teach about moral values was The Way to Happiness. After that conference I went home and showed it to my wife and kids. I told them a little bit about the book and then I left them with the video. When I came back, they had tears in their eyes! That was a very important moment for me; it meant everything, because I realized that The Way to Happiness was the solution that I had been looking for. Since that time I have been supporting and promoting The Way to Happiness. SOLUTIONS: How have you used The Way to Happiness to help others in your department? COLONEL PRADO: I believe that The Way to Happiness helps people in different ways and will always be most useful to the people that are able to realize the importance of valuable information. So the first thing that I do is explain the importance of the book. In this case I do it with the police officers who work with me, so that they can also apply it to their life and then they can share it with their family and friends. That has been the secret, they become ambassadors of The Way to Happiness. The activities we have developed mostly consist of delivering books and delivering The Way to Happiness course to the police officers and their families, as well as to the police academy. These officers are very committed. To spread the book, we do many different activities such as seminars in schools, malls and shopping centers, stadiums and farmers markets. We have even done theater nights, seminars, parties and exhibitions. We show the film and then we discuss it with the public and answer any questions the public have. At the end they make a commitment to practice the 21 precepts in their life and to share it with their family. We have also been delivering books to children and the people of Ibague, Melgar, and El Guamo and have organized free concerts and showings of The Way to Happiness Public Service Announcements in public areas. I have distributed over 36,000 booklets and more than 2,000 The Way to Happiness Videos. SOLUTIONS: What changes have you observed in Colombia that you attribute to The Way to Happiness? 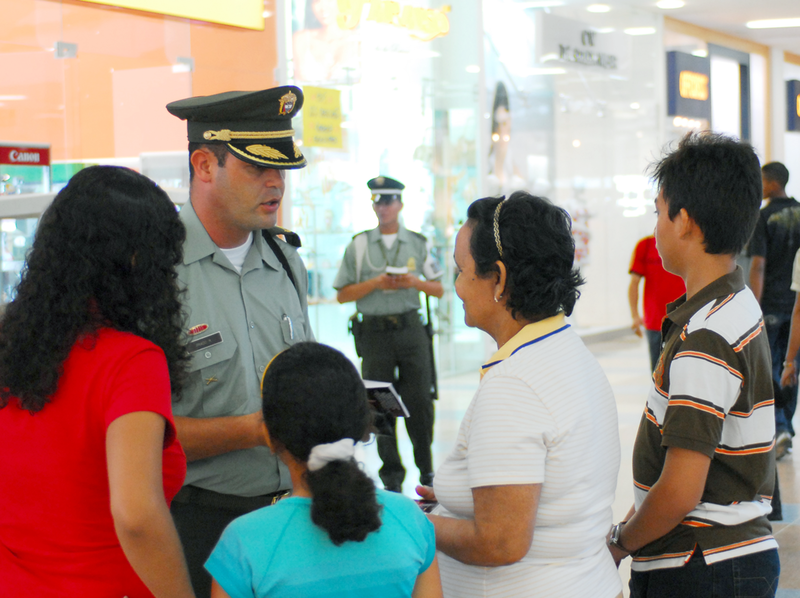 COLONEL PRADO: The first and most important thing is to be able to change people’s attitudes. Once that is done, people start caring more about themselves and others. When they are aware of the things they need to do to be happy and live in a better place, it helps decrease the crime rates. The public begin to obey the law, families become more united, and when families are together they are more prosperous. The Way to Happiness is a very noticeable contribution that leads to a change rapidly and efficiently. Ethics is reborn and moral values are applied on a daily basis. As a result, children are doing better in school, they feel happier, they have learned to solve their problems by applying the precepts. Even if it is a big problem they can handle it much better now that they have the information. Children that know The Way to Happiness are more productive and collaborative. SOLUTIONS: Are you interested in helping other areas and countries achieve the same success that Colombia has had with The Way to Happiness? COLONEL PRADO: Yes, you can count on me.